A quick glance at Stanford Graduate School of Business: currently ties in first place (with Harvard Business School) as the best business schools, according to US News & World Report (March 2012). It was ranked #2 for entrepreneurship. 6618 people applied to Stanford GSB in 2011; 7% were admitted and approximately 400 are in the class of 2013. Stanford’s class of 2013 students has median work experience of four years. The average GMAT score for the class of 2013 was 730. The Stanford GSB curriculum, which is based on the “noble calling” of management, is individually tailored according to work experience, background, and career goals. During the first year students take required courses (see detailed first year curriculum here) and during the second year students build their own curriculum based on electives (see details on the second year curriculum here). 16% of the class of 2011 graduates either started or were considering starting up entrepreneurial ventures. For summer positions for the class of 2012, 40 students received funding for an internship through the Entrepreneurial Summer Program (ESP). 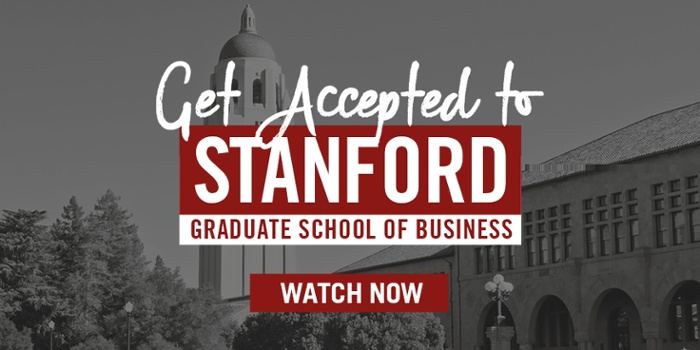 Are you applying to Stanford Graduate School of Business? Please see our Stanford B-School Zone and Stanford Application Packages for more information on how Accepted.com can help you get accepted.